Hello! I am Md. 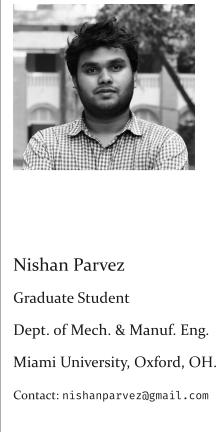 Nishan Parvez, a Mechanical Engineering graduate student at Miami University, Oxford, OH. Currently, I am also working as a research assistant at Zanjani Research Group. I am fascinated by natural phenomena and the fact that we can express them in terms of mathematical equations! My research interest lies at the intersection of Mechanical Engineering and Material Science. My current research focus is to investigate the directional binding of DNA-functionalized colloidal clusters using state of the art computational tools. I completed my undergraduate studies in Mechanical Engineering at Bangladesh University of Engineering and Technology (BUET), Dhaka. During my undergraduate years, I investigated numerical modeling and stress analysis of anisotropic lamina using displacement function based approach, among many other things. I am an avid reader and enjoy a good book as much as the next person. I love street photography, music, and webcomics. Often I spend my afternoon walking for hours to get the perfect shot! Thanks for visiting my site. For more information, check my curriculum vitae, my recent projects, or feel free to contact me.